We are the experts in house clearances in the Redruth area. Clearing houses have been our business since 1974. With over 30 years experience you can be assured our services are top quality. With over 30 years of house clearance expertise behind us Churchill’s can solve any house clearance issues you have such as clearing a house, loft space, garage and even sheds. You want a house clearance company that will remove furniture that is no longer needed, take out appliances, clear out loft areas, garages. We will even empty out garden sheds. You get a fast quality service that will remove all items from your property with care. In a responsive time frame of 3 - 4 hours. You get a skilled team of professionals that will arrive on the day with a large van and trailer. You want a house clearance company that provides you a legitimate invoice containing all of our business and tax details once your house clearance has been completed. Cash in hand is not accepted so please do not ask! You want a house clearance service that is completely worry free, professional & discreet. 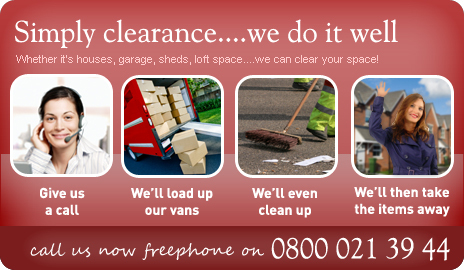 You want a house clearance company that will be punctual and does not deal in broken promises. A variety of estate agent services are provided below. If you want more information about our house clearances follow the link. You may be interested in further information from the probate solicitors below. If you require our quality house clearance expertise then visit the link. Information on conveyancing solicitors in your area are listed below. If you need quality house clearance services then click the link. Churchill's House Clearence provides you with the ease and efficiency to clear and recycle all your unwanted items. Churchill's House Clearence will ensure that your waste is disposed of in the right way and we sort out any recyclables possible.